Doritos are delicious chips and I love the taste of these cheese supreme corn chips. They are perfect when paired with a favourite salsa. I love the taste of cheese supreme Doritos but I have very little self control once I start eating them. This is a great option to keep my portions under control. I love Doritos they are one of my fave chips to eat and they aren’t over powering in taste either. These aren’t called cheese supreme for nothing. Doritos make the best corn chips and this one is not an exception. I find it a bit salty and a little too much flavour (powdered). I love these. So flavour packed and good to eat so many ways. On their own, with avocado dip, with mince and cheese and tomato sauce. Yum yum yum. 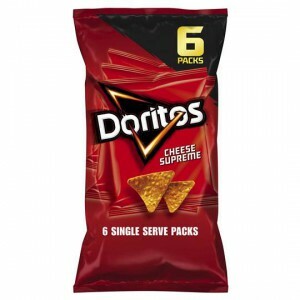 Doritos cheese supreme packs for perfect for a snack in the smaller sizes.The flavour is delicious and cheesey and also fantastic for making our nacho’s! I love the Cheese Supreme flavour in the Doritos corn chip range. They are stacked full of flavour and are very moreish. Highly recommend. The kids love these Doritos cheese supreme corn chips. The multi packs have the perfect amount of chips and the flavour is great. I only give it as a sometimes treat because of salt content.